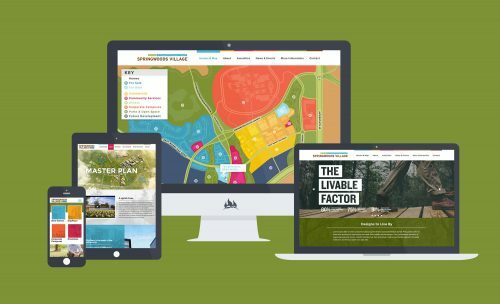 Web design helping redefine what a sustainable community can be. Springwoods Village is a transformational mixed-use community near Houston, TX, attracting national corporations, individuals, and families looking to live in a diverse and sustainable community. 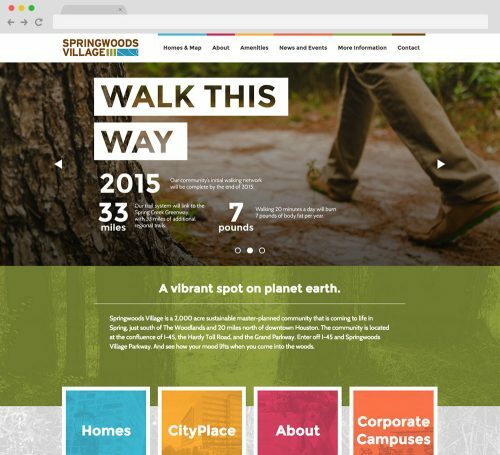 The previous Springwoods Village website was purely a brochure site, providing ineffective snippets of the overall community vision. FIREANT created a new custom WordPress solution, allowing for a flexible website to effectively present content about the community in all phases of the project. FIREANT focused on creating a clean design to showcase the community's highlights, while also providing a "tool belt" for various page templates and individual content modules to help the site grow and evolve with the community. 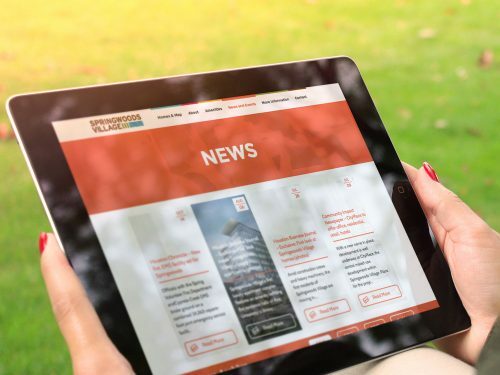 Being involved within the strategy layer allowed us to tailor the tool belt for the content authors and produce a result that is easy for them to make their updates. While the community was in development, there wasn’t a large offering of real images and content to support the community’s overall aesthetic. 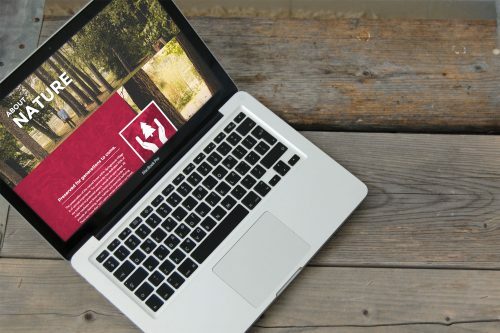 To accommodate this, we used a variety of patterns, community images, stock photos, and infographics to bring the site to life while still representing the end vision. We provided a flexible solution that allows for the evolution of content within the framework. 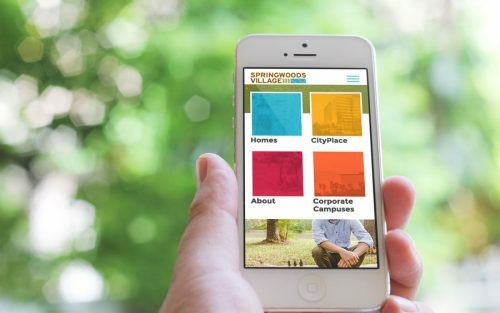 Using modular content and SCSS color themes, Springwoods Village has three integrations: Google Maps API, Gravity Forms with automated MailChimp, and a Facebook and Twitter Feed integration. was important for the Springwoods Village website. We designed audience-specific sections to effectively reach potential home buyers and renters, corporate representatives, potential businesses, current residents, and press looking for more information about the community. Not only did we technically facilitate a positive user experience by displaying content via a responsive framework, but we also ensured we supported each of the target audiences. We created a colorful community map to present content in an intuitive interface which promoted content exploration. 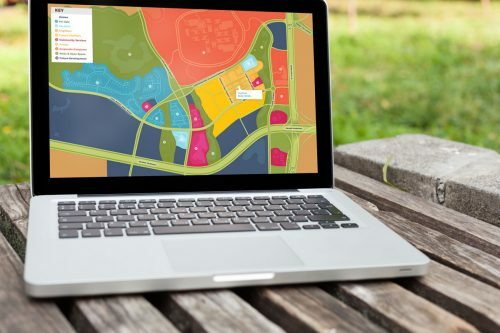 The community map showcases homes for sale, shopping centers, corporate campuses, and other amenities all of which were administered via the admin. This allows for easy content control by site administrators. FIREANT created a new custom WordPress solution, allowing for a flexible website to effectively present content about the community in all phases of the project.